Desonide is the generic name of a low-potency topical corticosteroid that has been available since the 1970s. It is primarily used to treat atopic dermatitis (eczema), seborrheic dermatitis, contact dermatitis and psoriasis in both adults and children. It has a fairly good safety profile and is available as a cream, ointment, lotion, and as a foam under the tradename Verdeso Foam. 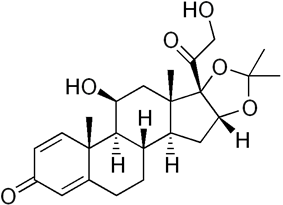 It is a group VI corticosteroid under US classification, the second least potent group.